There is one reoccurring thought running through my mind during this whole period of time: Holy crap, this is really happening. I need to focus on Ministry works because this is where my future is. My next step. As much as fans of Billi and Morevi want a new installment, I will hazard a guess they also want me writing. It may not be where people want me writing, but it’s where I need to be. It’s also a lot of fun. I’ve been enjoying Wellington, Eliza, and their steampunk England so much that I find myself missing their world, even when editing and proofing chapters. There’s a lot of potential here, as well. I don’t want to miss a step, so this means making Ministry the focus of my writing. You might not think it is a difficult decision, but it is. Side-stepping questions about Billi and Morevi, hearing fans ask about future podcasts, and receiving praise for these properties are all welcome and heartwarming. I appreciate them all, and they make me want to write in those universes again. But there it is again: writing. Of course my readers and listeners want me to write. Feedback from my short stories has told me as much. The truth of it was in the sales, when I would see how much I would make off my other properties, including the Twitter and podcasting books. Would I ever really be able to make a living as this? Computer books have a limited shelf life; and to make a living with an independent press, I would have to double (or perhaps, even triple) my output. To hit that goal of full-time writing, I need to produce the books that can get me there. I believe those books are the ones I’m working on with Harper Voyager. Come this Spring, we will see. Letting go of these two properties has been hard, but I still believe — no kidding, I believe with purest conviction — that I will return to these worlds. 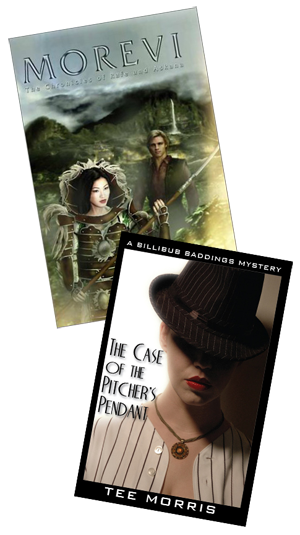 Perhaps Billi will find a home with another publisher. Wouldn’t that be fun? Rafe, while dashing in his doublet and rapier, would look rather smart in an aviator cap and goggles, a hyper-velocity aetherflux at his side. I’ve closed the door, sure, but it’s not locked. As we have all seen as a community, there are no sure things, no slam dunks, in the entertainment industry. I still recall the words of my friend from across the pond, Martyn, when he tweeted to me “What a difference a year makes.” He’s right. Within a year, I could be forging ahead. Within a year, I could be on a new path. A lot can happen in this year, and I’m not dismissing Billi or Morevi and their futures. I will return to those worlds. Someday. 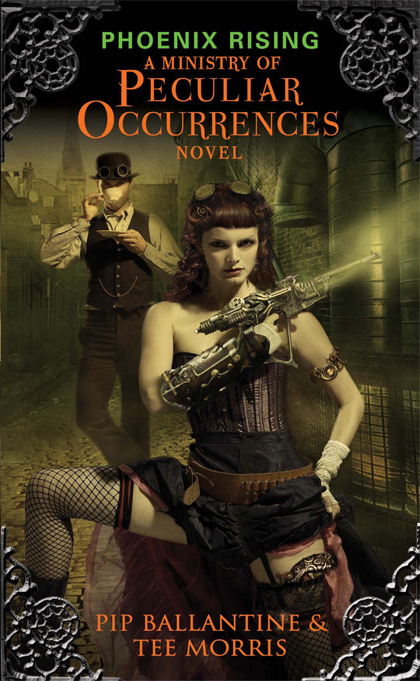 For now, I’m giving dwarf detectives and upstart pirates a break; and my attention turns to gears, gadgetry, and goggles. In place of Mick’s Diner and the Defiant, I’m delving into a dark depository of mysterious talismans, trinkets, and tall tales that could contain a bit of truth. Bullets and baldricks are swapped out for boilers. In this new world, a plucky pepperpot of the colonies and a meticulous bookworm face intrigue, danger, and secret societies hell-bent on overthrowing the Empire. Sounds like fun? I hope so. Maybe you’ll want to join me on this little trip. I’m so excited to have a copy of MoPo: Phoenix Rising on my bookshelf and, even more importantly, in my hands. Good luck and know that we’re behind you and waiting with our wallets open for your next work in print. As much as I love you and Pip separately, parts of me tremble (and no I won’t tell you which parts) when faced with your combined awesome. It’s like those awesome Transformers that combine to become Devastator. Granted, those are Decepticons and they’re evil..
As I get to know you little by little I am even more eager to find your past works and eagerly anticipate your future ones. I can’t wait to actually get to read MoPO stories. Much as I may love some of your older characters, I’d never want you to be in a position to NOT be able to explore new worlds and new stories. Heck, you’re one of the folks who reminded me that exercising your creativity in any form is a good thing. So Excited! I signed up to get a copy via NetGalley, hoping I get one. If not, I will surely be buying one. I can’t wait to read the new Ministry books! We support you and understand it is not easy to do what you do, Tee. Any writing you bring out is something fun we didn’t have before. Cheers!